Do you have that space in your home that you see many times a day and it just doesn’t look just right? It’s either too cluttered, too sparse or just off in some way. This space in my house is my coffee table. Yes, I know it doesn’t seem like a big deal but it can be such an eye sore. It is right smack dab in the center of our main living space. So I’ve decided to “shop my stash” and decorate! My first plan of action was to consult… Pinterest. I came up with the following elements needed for a well staged table. 4. Books are essential. Keep in mind the color of their jacket It’s all for staging purposes. 5. Add a candle, it gives it a homey feeling. To get started, I cleared off our coffee table As you can see, it is a well used piece of furniture in our home Many years ago when the boys were small, I wanted new furniture but I new it was not the time in life for that. So being the thrifty gal I am, I painted it and it’s been just fine. It’s a great quality piece I’m glad I kept it. The next step in this staging process is to shop your stash. Remember, this is no cost decorating. My technique is quite unique. Keeping in mind the needed elements for staging, I grabbed a laundry basket and shopped my stash. Once you have your collection, you might have to play around with the placement of the items on the table until it “feels” just right. If your home is anything like mine , there will be surely opinions shared. This is a communal space after all. Keep it simple and not too cluttered and then just sit back and enjoy, because truly that is what this space is for. If you would like to see other spaces decorated by shopping my stash, you can see them here, here and here Happy decorating! 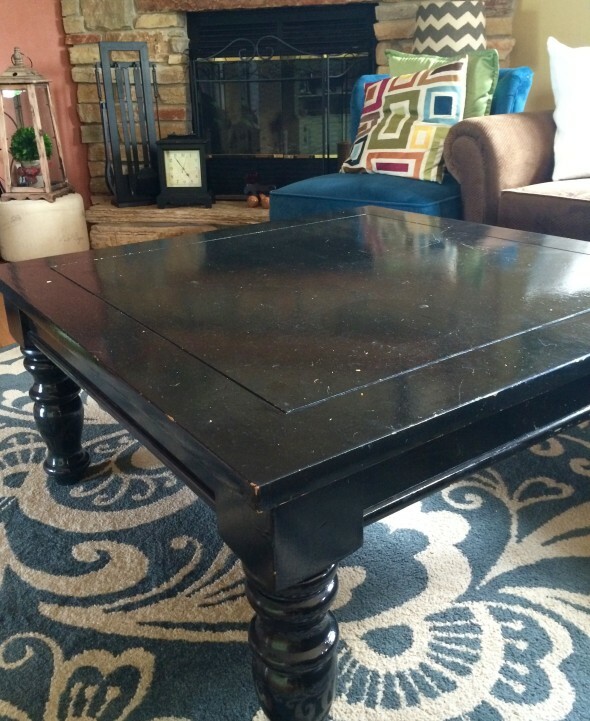 Great tips, and I love your big coffee table – I’m looking for something like that myself! Thanks for linking up at Talented Tuesday! Wow…First of all I love the idea of this shopping your stash decorating. My coffee table gathers many items, too so thank you for the great tips. So very well put together, Mary! Second of all, you new blog look caught me off guard – love the new look! Blogelina does an amazing job! Some day I will have no toddlers and look forward to a beautiful table like this haha! Thanks for linking up at MeetUp Monday, and hope to see you again next week! Hi, lovely to meet you. I hope you have enjoyed Fridays Blog Booster Party. We are excited that you are here, our aim here is to help boost each others blogs. You did a great job of decorating your nice big coffee table. I love that your feet are allowed on it, nice and relaxed. Just the way home should be. 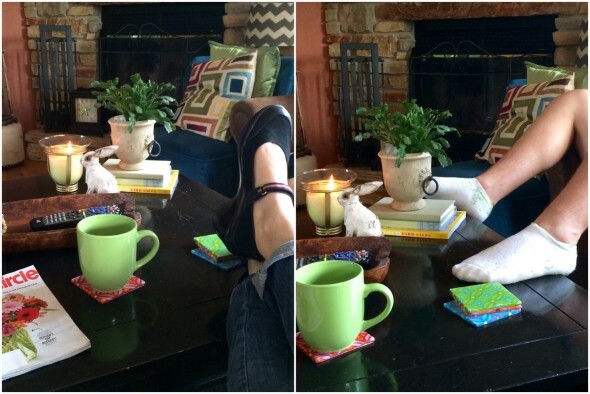 Big coffee tables are are the best to fit everything and to rest your feet. Nice job! Your styling looks great. I love shopping my stash, too and I change things up fairly often. No cost decor is the best! Yes Beverly, it’s fun to change things up! Great tips! I love how your table turned out. Thanks for linking up to the Bloggers Brags Pinterest Party. I have pinned to the Bloggers Brags Broad. Great ideas! I need to find a tray for my coffee table. Thanks for sharing with us at Merry Monday. Hope to see you again next week! I think I need to work on mine a bit LOL All it has is a dish with some decorative balls in it. Thanks for the tips! Lol Ours always gets a collection…. I love using seasonal decorations on a coffee table to add just enough character without making it look cluttered. Thanks for sharing! I’m in love with trays, so of course I have one on my coffee table. There’s also a pretty flower arrangement (faux but looks real), books and magazines. The grandkids rearrange it every time they stop by, but it’s an easy fix after they leave. 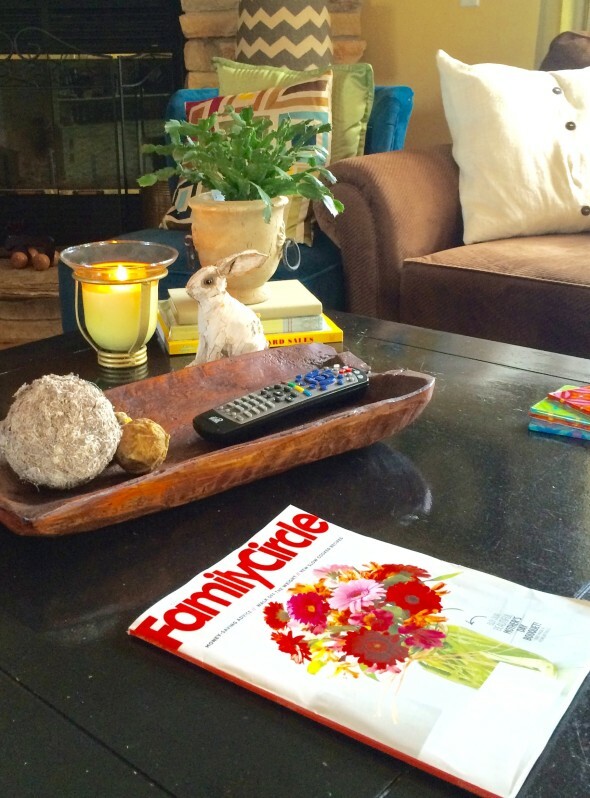 Love your little rabbit and your coffee table decor! You are are such an awesome grandma. They are lucky to have you, Alli.